Has always been one of my favoured dishes whenever I went to a Dhaba /North Indian restaurant. 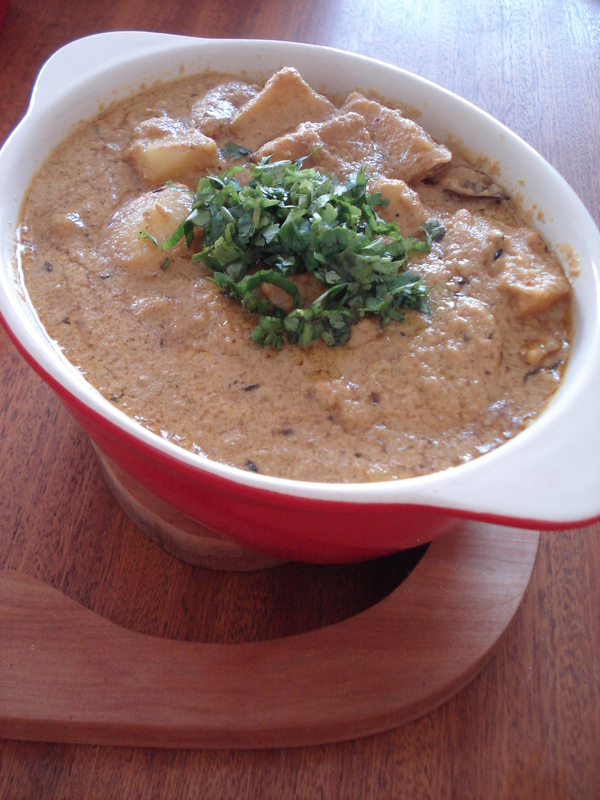 The Dum Aloo again is a special dish that has special memories that I associate with home and my childhood. Racing against time to complete the end of the month reports, it was a tradition to not cook dinner on the last day of the month because all four of us would be busy as bees. As much as it was busy it was also memorable and a treat for us back then. We ordered our night’s dinner from the Kwality Riviera Punjabi Dhaba in Adyar. Our standard order used to be Butter naan, Palak Paneer/Kadai Paneer (there has to be atleast 1 paneer dish) and the Dum Aloo. Realising it had been ages since I had tasted Dum Aloo, especially since I am now keen on making dishes that I enjoyed eating, but never made before, I decided that this would be something I will do for a get together. It is risky for a first attempt. But what the heck! What is cooking without a bit of risk and adventure? – I ask! Boil and peel the potatoes. Prick the potatoes making 5-6 holes with a toothpick or a fork to allow the potatoes to absorb the flavour later. Shallow fry the potatoes until it turns golden brown to give it a crisp texture on the outside and set aside. Grind all ingredients of the masala paste into a smooth paste. Heat ghee/oil in a pan. Add the masala paste. 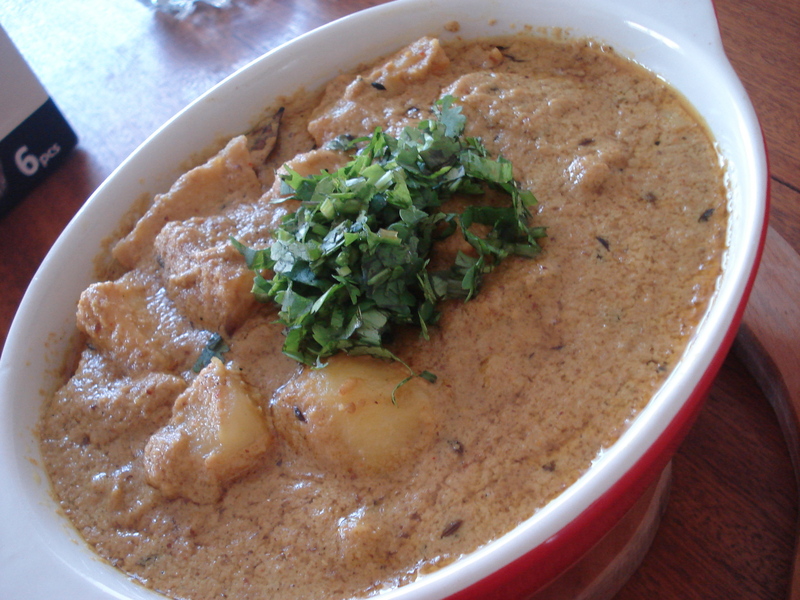 After the rawness of the paste is gone and the ghee starts to separate from the gravy, add milk and water. Let it simmer for a while. Add the lemon juice to the gravy and then add the potatoes. Add sugar for the balance in flavours. Cook covered partially for 8-10 minutes to allow the masala to seep into the potatoes. Garnish dish with chopped coriander. Pretty good for a first attempt. Although I have a small suggestion… While the gravy looks extremely delicious and creamy… it lacks the colour… did u use canned tomatoes or have u missed out on using tomatoes? coz there seems to be no mention of a puree or a paste in ur recipe? coz tomatoes are a very important ingredient for dum aloo. Surprising indeed!!! That’s what I thought too…I was surprised that the recipe had no tomatoes. But it turned out just as good without it. I was too afraid to use that chilli powder from hell where a pinch feels like a tablespoon of it…LOL 🙂 Thanks for the comment. @ Lux – I think the lemon acts as the acid instead of tomatoes…but no doubt tomatoes will definitely take it to a whole new level…and I am also thinking of losing the coconut too next time I am going to make it.